You can win this 3 piece Fresh Works set from Rubbermaid! Enter below! 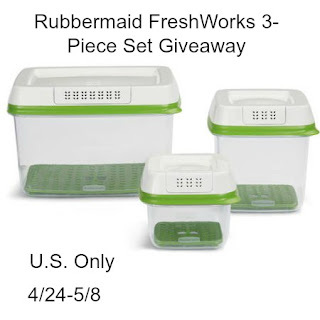 I would store my leafy green lettuce, strawberries, & organic grape tomatoes in these FreshWorks containers. I purchase quite a bit of the various lettuces at the grocery & they just don't last more than a week. I would mostly use them for leftovers. I often store leftovers in unclear bowls and forget about them or what's in them. I would love these containers! I hate throwing food out. I'd store my green leaf lettuce and strawberries in these containers. I would use them to store my strawberries, lettuce and tomatoes. Also would like to use it for cantaloupes. These would be great for summer berries. We have wild raspberries, blackberries and blueberries in our woods and they go bad if any moisture gets sealed with them. I would use these to store snacks for my grandson. I would definitely use one of these for my lettuce, I have a terrible time keeping it. I'd also use them for my fruit. I would love these containers to help me store my fresh veggies. I do not like buying fresh veggies that go bad within a couple of days of purchasing them and these would help me prevent that. I'd use them the most for strawberries and fresh green beans. I always have them spoil on me in regular containers and I do not like wasting food! I would put strawberries in these! Mine always go bad way too fast. I would keep my strawberries and other berries in them. I would also keep my lettuce in them. I would keep my leftovers in them. We always eat our leftover so these would come in handy. I would store my berries in these. It's hard for me to get to the market, so I usually buy 6 or 7 packages of blueberries & raspberries and a time. The raspberries go bad so quickly! This would save me a lot of money. I would store cheese in some of them. We use a lot of cheese and I could be block and not worry about it drying out. Cheese once it dries is still OK for some things but not for sandwiches. I would use them for strawberries, cherries and romaine. The foods of summer.